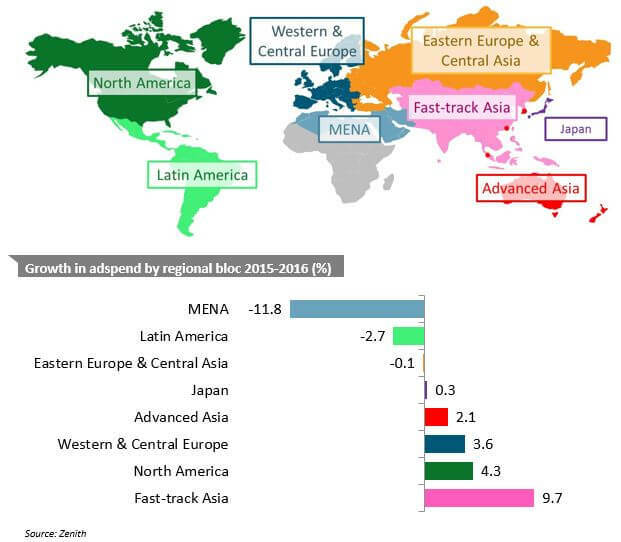 Zenith predicts global ad expenditure will grow 4.4% in 2016, reaching US$539 billion by the end of the year. This is 0.3 percentage points more than we forecast in June. The increase is mainly the result of upgraded forecasts for network TV and social media in the US. 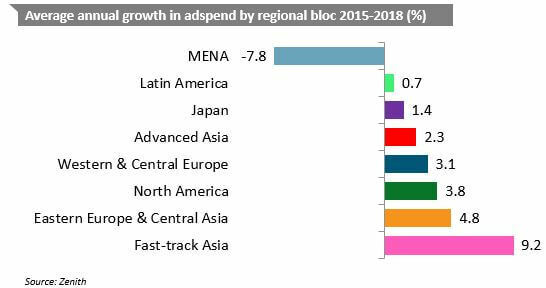 Since 2012 we have looked at the growth rates of different regional blocs defined by the similarity of the performance of their ad markets as well as their geographical proximity. This captures the behaviour of different regional ad markets more effectively than looking at regions defined purely by geography, such as Western Europe, Central & Eastern Europe and Asia Pacific. See the end of the Executive Summary for a complete list of countries by bloc. Western & Central Europe was one of the regions most affected by the financial crisis of 2008-2009, which then turned into the eurozone crisis. The eurozone crisis is not definitively over – Greece’s debts are still unsustainably high, for example – but the region’s ad market has been enjoying solid recovery since 2014. Advertising expenditure grew 3.9% in 2014 and 2015, and is forecast to average 3.1% growth a year to 2018. Some of the fastest growth is coming from ad markets at the periphery of the eurozone that suffered the most after the financial crisis. Ireland has enjoyed 8% annual growth since 2014, and should continue to do so for the rest of our forecast period. We forecast Spain to grow 6% a year to 2018, after 7% growth in 2015, while Portugal is growing at 4%-5% a year. Even Greece should enjoy 6%-7% annual growth in 2017 and 2018. The slowest growing of the peripheral markets is Italy, which is growing at 2%-4% a year. Meanwhile, France continues to lag behind with weak business confidence and household consumption, and industrial unrest. We forecast French adspend to grow only 0%-1% a year to 2018. The UK, the stand-out growth market for the last four years, is finally starting to slow. The slowdown began before the vote to leave the European Union in June, but the ‘Brexit’ result is likely to further weaken growth over the next few years. We forecast 5.4% growth in UK adspend this year, down from 9.2% in 2015, and 3%-4% growth over the next two years. Eastern European advertising markets, such as Russia and Turkey, generally recovered quickly after the 2009 downturn and continued their healthy pace of growth, largely (though not entirely) unaffected by the problems in the eurozone for the next four years. Their near neighbours in Central Asia, such as Azerbaijan and Kazakhstan, have behaved very similarly, so we have gathered them together under the Eastern Europe & Central Asia bloc. This bloc grew 11.5% in 2013. The conflict in Ukraine severely disrupted the domestic ad market, while Russia has suffered from sanctions imposed by the US and the EU, the sanctions it imposed in response, and a withdrawal of international investment. These shocks have been exacerbated by a sharp drop in the price of oil – which accounted for 70% of Russia’s exports in 2014 – and devaluation of the Ukrainian and Russian currencies. These problems then spread to Belarus, whose main trading partner is Russia by some distance. In 2015 adspend shrank by 45% in Ukraine, 28% in Belarus and 9% in Russia. Russia’s ad market proved more resilient than we feared, and having avoided collapse in 2015 is staging a mild recovery in 2016. We forecast 4% growth in Russia this year, and 12% growth in Belarus, but Ukraine will remain stagnant. The region will be dragged down in 2016 by Azerbaijan, which we forecast to shrink by 12% this year, and Kazakhstan, where were forecast a 38% collapse in adspend. Overall we expect adspend in Eastern Europe & Central Asia to shrink 0.1% in 2016, after 7.5% decline in 2015, but we forecast growth to pick up to 6.6% in 2017 and 8.1% in 2018. Japan behaves differently enough from other markets in Asia to be treated separately. Despite recent measures of economic stimulus, Japan remains stuck in its rut of persistent low growth. We forecast average adspend growth of 1.4% a year between 2015 and 2018. Apart from Japan, there are five countries in Asia with developed economies and advanced ad markets that we have placed in a group called Advanced Asia: Australia, New Zealand, Hong Kong, Singapore and South Korea. We estimate 2015 growth here at 5.3%, the best performance since 2011, but forecast growth to slip back to an average of 2.3% a year through to 2018. We characterise the rest of Asia as Fast-track Asia (China, India, Indonesia, Malaysia, Pakistan, Philippines, Taiwan, Thailand and Vietnam). These economies are growing extremely rapidly as they adopt Western technology and practices, while benefiting from the rapid inflow of funds from investors hoping to tap into this growth. Fast-track Asia barely noticed the 2009 downturn (ad expenditure grew by 7.9% that year) and since then has grown very strongly, ending 2015 up an estimated 9.5%. However, the Chinese economy – the main engine of growth in Fast-track Asia – is finally starting to slow after years of blistering growth, and the ad market is slowing down alongside it. China accounts for 74% of adspend in Fast-track Asia, so its slowdown naturally has a large effect on the region as a whole. 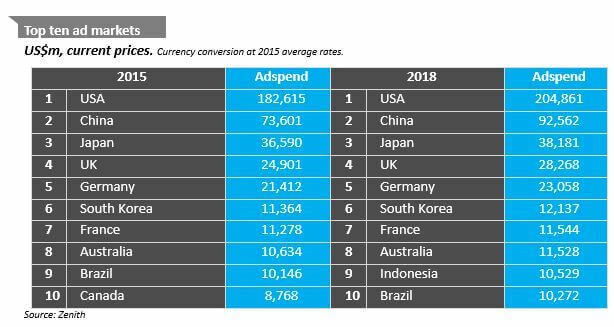 We expect ad expenditure in Fast-track Asia to grow 9.7% in 2016, and at an average rate of 9.2% a year between 2015 and 2018, down from 12.0% a year between 2010 and 2015. North America was the first region to suffer the effects of the financial crisis, but it was also quick to recover, and adspend in North America was more robust than in Western & Central Europe between 2012 and 2014. This changed in 2015 as the European markets most affected by the eurozone crisis recovered rapidly, while declining network television ratings eroded US adspend growth. US networks have had a good year so far in 2016, thanks to high spending by pharmaceutical and packaged goods advertisers, and expenditure on US social media has accelerated. North America is therefore ahead of Western & Central Europe again: for the former we forecast 3.8% annual growth in adspend to 2018, compared to 3.1% for the latter. Argentina, Brazil, Ecuador and Venezuela (which account for 56% of Latin American advertising expenditure) are currently suffering recession, compounded by rapid devaluation in Argentina and full-blown crisis in Venezuela. In December last year the Argentinean government lifted its exchange rate controls, leading to an immediate 30% devaluation of the currency, followed by further declines this year. Meanwhile Venezuela is running out of basic supplies and is heading for hyperinflation. 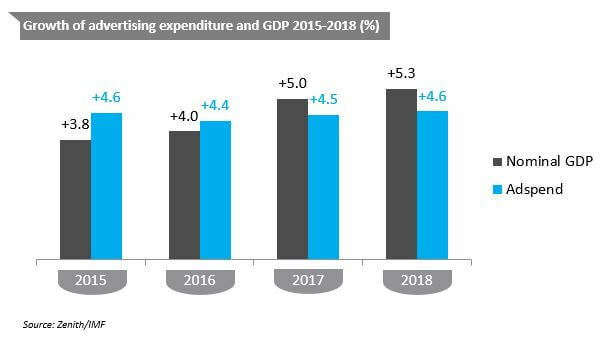 We forecast Latin American advertising expenditure to shrink 2.7% in 2016, down from 6.3% growth in 2015, followed by mild recovery in 2017 (of 1.6%) and 2018 (of 3.2%). The drop in oil prices in 2014 has had a severe effect on the economies in MENA, and has prompted advertisers to cut back their budgets in anticipation of lower consumer demand. Political turmoil and conflict have further shaken advertisers’ confidence in the region. We forecast an 11.8% drop in adspend in MENA this year, followed by further declines of 7.3% in 2017 and 4.2% in 2018, averaging out at a 7.8% annual decline to 2018 – that’s up from the 5.8% annual decline we forecast back in July. Of the various blocs, MENA is the clear underperformer, and Fast-track Asia the clear outperformer. The other blocs range gradually from barely growing (Latin America) to healthily expanding (Eastern Europe & Central Asia). After a return to mild growth by US television networks, and an increase in spending on social media, we now expect the US to be the leading contributor of new ad dollars to the global market between 2015 and 2018, beating China – which we forecast to lead in our March and June forecasts – by US$3.3 billion. Between 2015 and 2018 we expect the global ad market to grow by US$73 billion. The US will contribute 30% of this extra ad expenditure and China will contribute 26%, followed by Indonesia, which will contribute 6%, and the UK, which will contribute 5%. 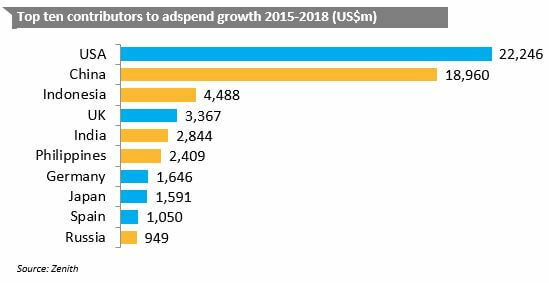 Five of the ten largest contributors will be Rising Markets*, and between them they will contribute 41% of new adspend over the next three years. 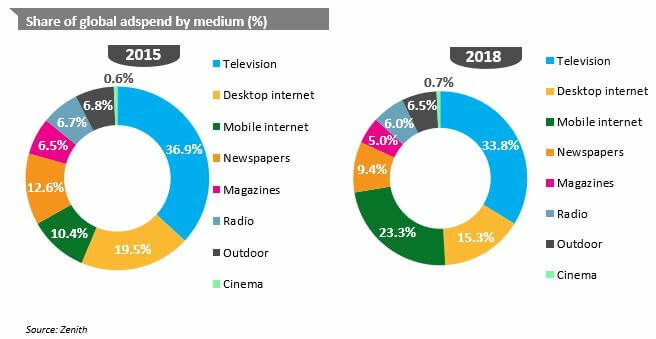 Overall, we forecast Rising Markets to contribute 54% of additional ad expenditure between 2015 and 2018, and to increase their share of the global market from 37% to 39%. The top eight advertising markets will remain stable between 2015 and 2018. Over this period Indonesia will rise from 14th to 9th, pushing Brazil down from 9th to 10th, and Canada from 10th to 12th. The internet is still the fastest growing medium by some distance. Internet adspend grew 20% year on year in 2015, and we forecast an average growth rate of 14% a year between 2015 and 2018. Internet advertising accounted for 29.9% of global ad expenditure in 2015, up from 26.0% in 2014. By 2018 we expect internet advertising to attract 38.6% of all global advertising, after overtaking television to become the world’s largest advertising medium in 2017. Display is the fastest-growing internet sub-category, with 15% annual growth forecast to 2018. Here we include traditional display (such as banners), online video and social media. All three types of display have benefited from the transition to programmatic buying, which allows agencies to target audiences more efficiently and more effectively, with personalised creative. We think that traditional display peaked in 2015, however, and forecast an average of 1.8% annual decline to 2018. This means that online video and social media will be the sole sources of growth for display advertising over the next three years. Fortunately these are growing very quickly: we predict online video advertising will grow by 20% a year on average between 2015 and 2018, while social media will grow 27%. The sudden decline in traditional display is a result of the rapid transition to mobile advertising. Banner ads are much less effective on mobile devices than on desktops – consumers find them more intrusive, and are more likely to click on them by accident than by design. Online video, by contrast, is benefiting from the increasing availability of high-quality content, and improvements to the mobile viewing experience, such as better displays and faster connections. And for many consumers, checking their mobile devices for social media has become a regular, ingrained habit, while social media ads blend seamlessly into their mobile app newsfeeds. We expect paid search to grow at an average rate of 13% a year to 2018, driven by continued innovation from the search engines, such as personalising search results, automatically matching search terms to content available on advertiser websites, and enhancing local and real-time search. Online classified lags slightly behind search, and we forecast 12% annual growth to 2018. Looking at internet adspend by device reveals the dramatic ascent of mobile advertising (by which we mean all internet ads delivered to smartphones and tablets, whether display, classified or search, and including in-app ads). We estimate that mobile advertising grew 94% in 2015, and we forecast an average annual growth rate of 36% a year between 2015 and 2018, driven by the rapid spread of devices and improvements in user experiences. By contrast we forecast desktop internet advertising to shrink at an average rate of 4% a year as advertisers follow consumers to mobile. We estimate global expenditure on mobile advertising at US$53 billion in 2015, representing 34.8% of internet expenditure and 10.4% of total advertising expenditure (this total excludes a few markets where we don’t have a breakdown by medium). By 2018 we forecast mobile advertising to grow to US$134 billion, well ahead of desktop’s US$88 billion total, having overtaken desktop in 2017. Mobile will account for 60.3% of internet expenditure and 23.3% of all expenditure in 2018. Since it began in the mid-1990s, internet advertising (both desktop and mobile) has principally risen at the expense of print. Over the last ten years internet advertising has risen from 6% of total global spend (in 2005) to 30% (in 2015). Meanwhile newspapers’ share of global spend has fallen from 29% to 13%, while magazines’ has fallen from 13% to 7%. Print titles will continue to lose market share as their readers continue to move to online versions of the print brands or other forms of information and entertainment entirely. We predict newspapers and magazines will continue to shrink at average rates of 5% a year between 2015 and 2018, ending with 9% and 5% market shares respectively. Note that our figures for newspapers and magazines include only advertising in printed editions of these publications, not on their websites, or in tablet editions or mobile apps, all of which are picked up in our internet category. The performance of print editions does not describe the overall performance of newspaper and magazine publishers. Television is currently the dominant advertising medium, attracting 37% of total spend in 2015. As mentioned earlier, however, we now expect the internet to overtake television to become the largest medium in 2017. Looking at the ad market as a whole, including search and classified, we think television’s share peaked at 39.5% in 2012, estimate it at 36.9% in 2015, and expect it to fall back to 33.8% by 2018. However, one of the reasons for television’s loss of share is the rapid growth of paid search, which is essentially a direct response channel (together with classified), while television is the pre-eminent brand awareness channel. Television does not compete directly against search, and indeed the two can complement each other, for example by running paid search activity to take advantage of the increase in searches driven by a television campaign. Taking internet classified and search out of the picture, television will remain the principal display medium for many years to come. We estimate television accounted for 44.3% of display expenditure in 2015, and will attract 42.9% in 2018. If we consider audiovisual advertising as a whole – television plus online video – we see that it is in fact gaining share of display advertising. Television offers unparalleled capacity to build reach, while online video offers pinpoint targeting and the potential for personalisation of marketing messages. Both are powerful tools for establishing brand awareness and associations. We estimate that audiovisual advertising accounted for 48.3% of display advertising in 2015, up from 43.8% in 2010, and expect its share to reach 49.6% in 2018.